'Any Day Now' in 2018 by French artist Sandrine Kern. Oil and cold wax on canvas, 54 x 54 in. This abstracted landscape painting features a forest scene in a soft palette of colors including brown, yellow, green, blue, black, and white. 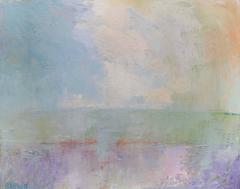 Sandrine Kern's work is indicative of landscapes conjured by memory that communicate residual emotions to her viewers. 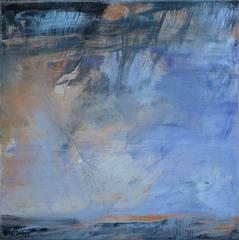 The thick surfaces of her paintings are built up through her unique alteration of a technique similar to encaustic. Instead of utilizing hot wax in her process, Kern combines oil sticks, oil paint, and cold wax to create a creamy, rich surface rifled with depth. 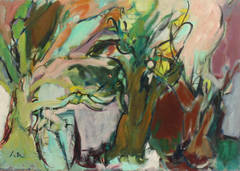 She then further manipulates the surface through the reductive process of scraping away layers with a knife and solvents. Born in Paris, France, Sandrine Kern holds a MFA with Honors in Painting and Drawing from Ecole Nationale Supérieure des Beaux Arts de Paris, France. 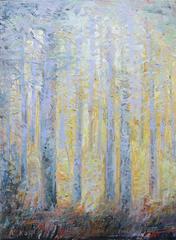 Her work is held in private collections including The Mitchell Collection, Jacqueline Bisset, Boutros Boutros-Ghali, David Schwimmer, Lisa Kudrow, and Mike Dunleavy, Sr.
Abstract landscape oil painting depicting a forest early in the morning.